Ion Builders specializes in custom decks & fences --No job is too big or too small. We'll work with you from design inception, to installation, and see you through one full year of Satisfaction Guaranteed. Our designs are adaptable to your terrain and landscape, and we will work with you so that the finished product adds beauty, function and value to your home. Need help repairing major and minor fence / deck issues? Ion Builders has you covered. 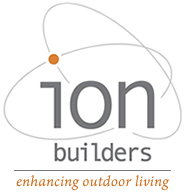 Ion Builders can help you create that perfect outdoor space. See our gallery for some ideas to get you started!